29 Best Swallow Vintage Images! 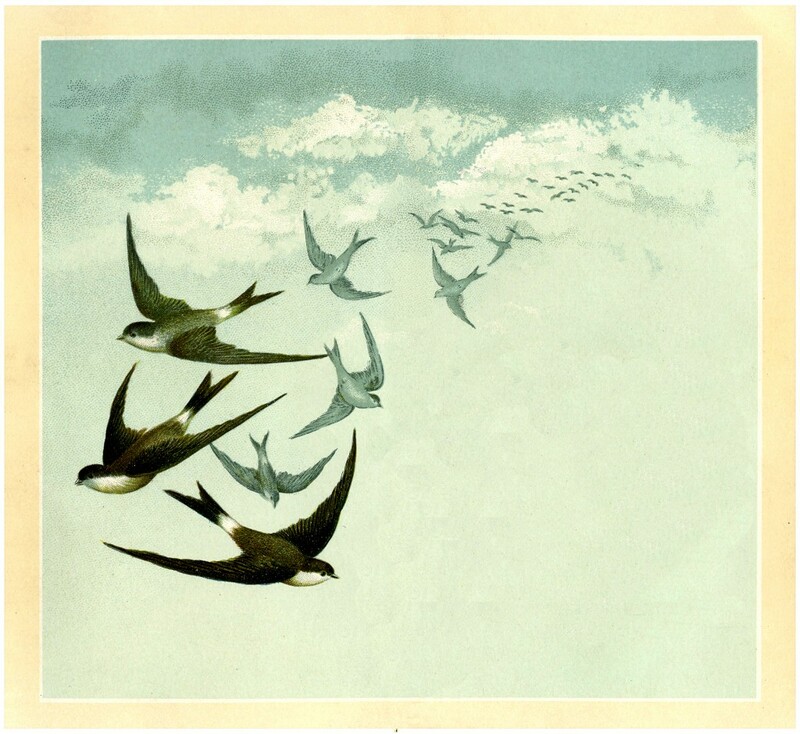 Today we have a captivating collection of 29 Best Swallow Vintage Images – FREE! Below you will find these beautiful birds flying, in pairs, and with flowers. 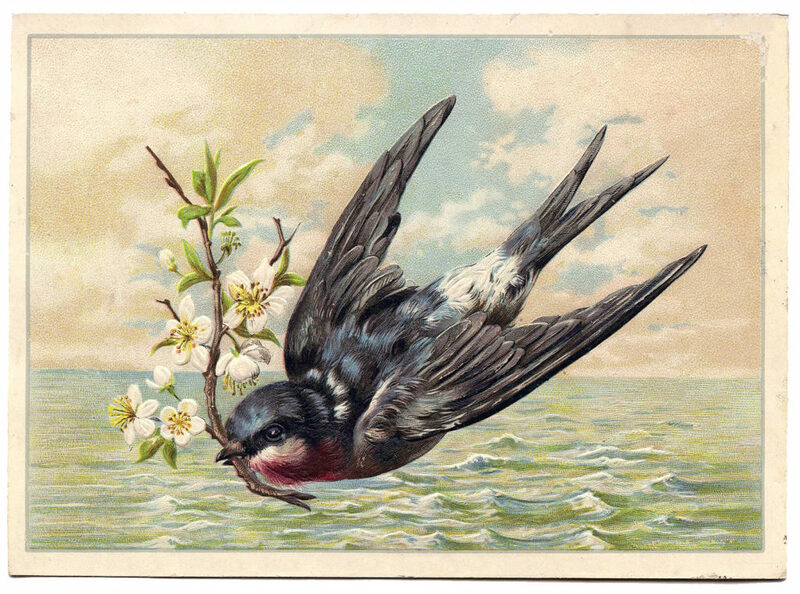 We have vintage postcards with the Best Swallow Pictures. I just adore this series! The images are perfect for your Handmade Cards or Mixed Media Projects. Above is a really fabulous looking Swallow flying across the Ocean. He has a flowering branch in his beak. This is a really fabulous looking Swallow, (actually 2), flying across the Ocean. The larger one has a little flowering branch in its beak as well. Gorgeous!! 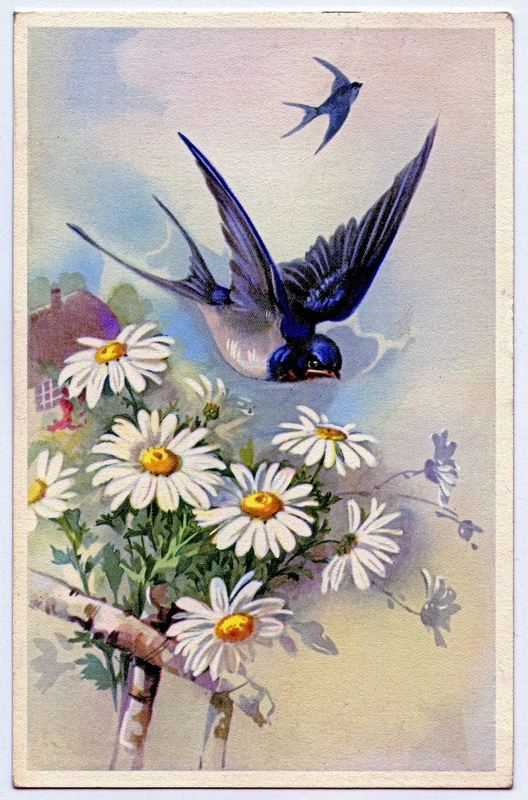 Above is a pretty vintage postcard with 2 Swallows flying over a bunch of cheerful looking Daisies! Such a nice one for Spring. 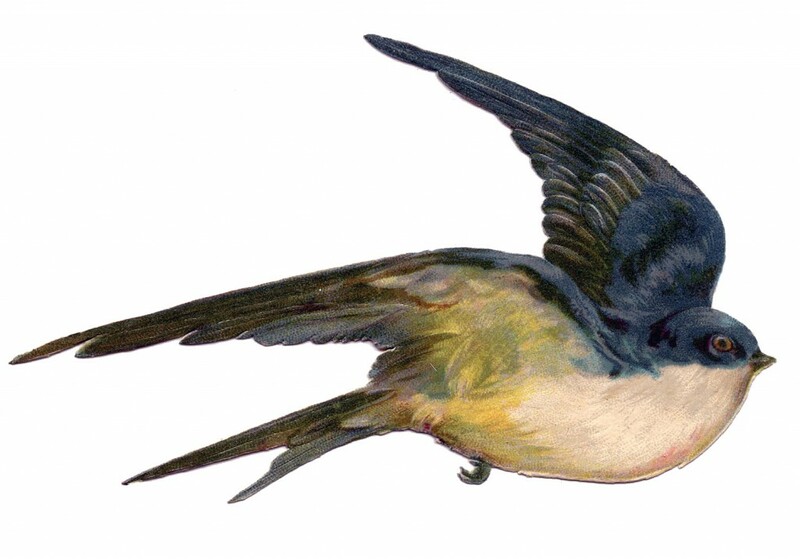 This is an extra pretty Birthday Swallow Image! Shown here is Antique Birthday Postcard. 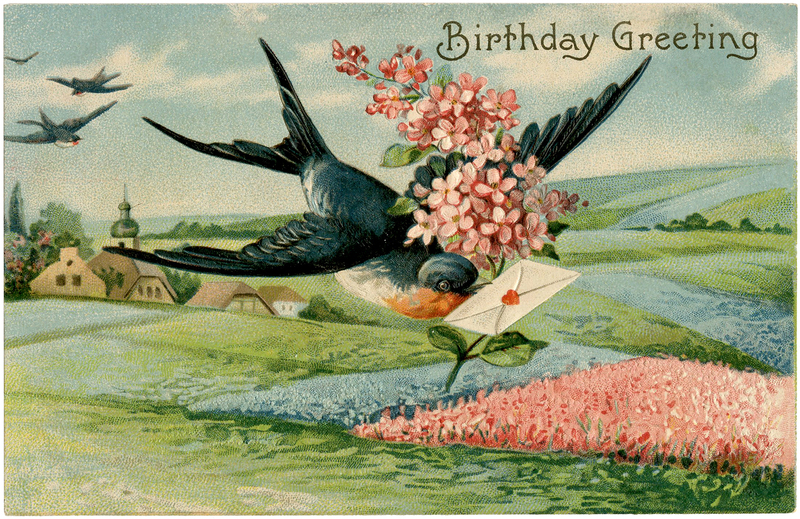 The card features a lovely Swallow Bird flying through the air with a Letter and some Flowers. Such a beautiful scene! There is a charming Village below along with green Meadows and fields of Flowers! Here we have a very charming Vintage Birthday Postcard. 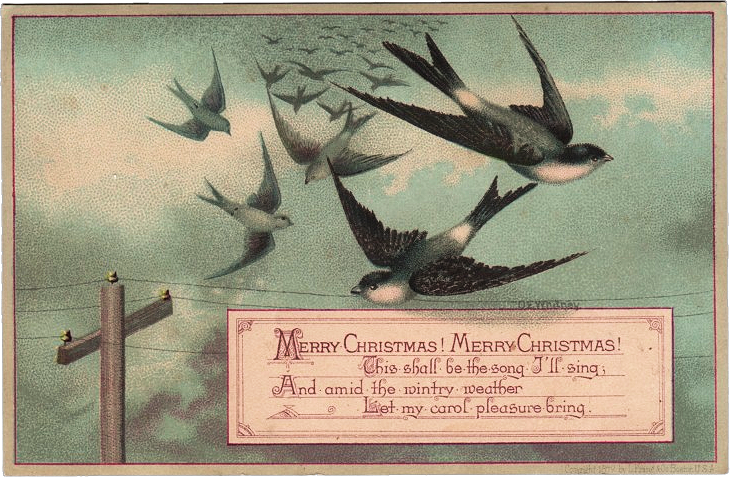 This card has a lovely illustrated Swallow or perhaps a Bluebird. 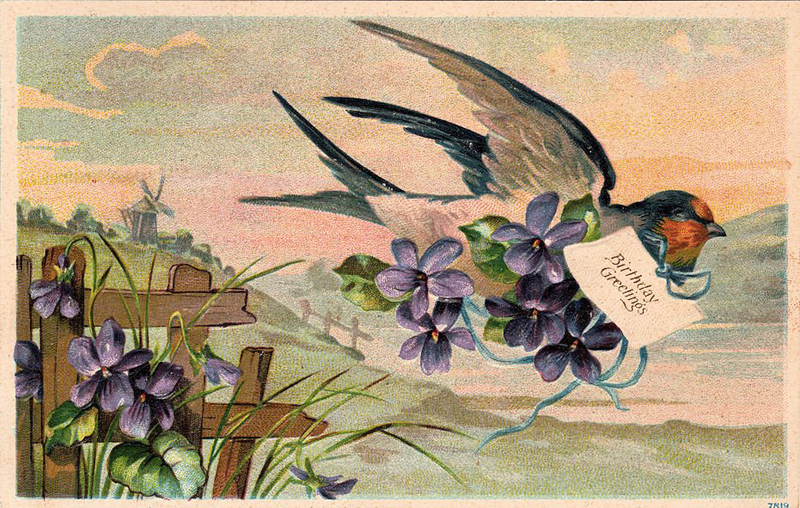 The sweet bird is flying away with a bouquet of Violets and a Birthday greeting! Above is a lovely Bird with Floral Wreath Image! 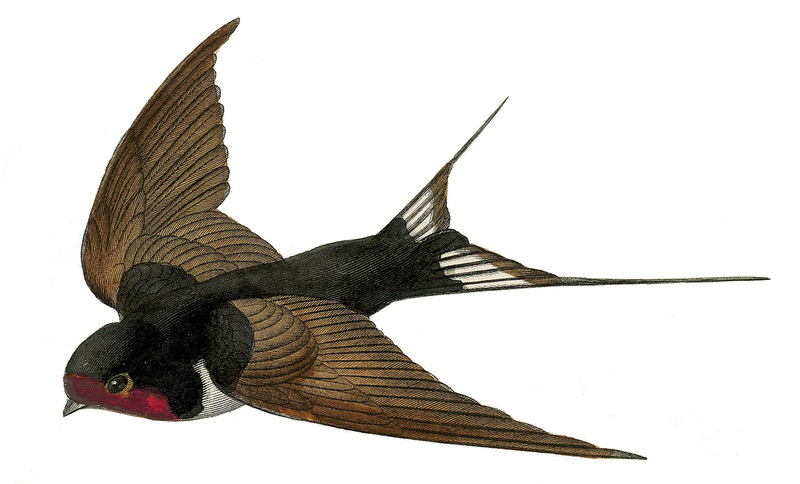 It features a pretty Swallow flying with a sealed envelope in his beak. Perhaps a Birthday Wish or a Love Letter. He’s surrounded by a beautiful Floral Wreath. 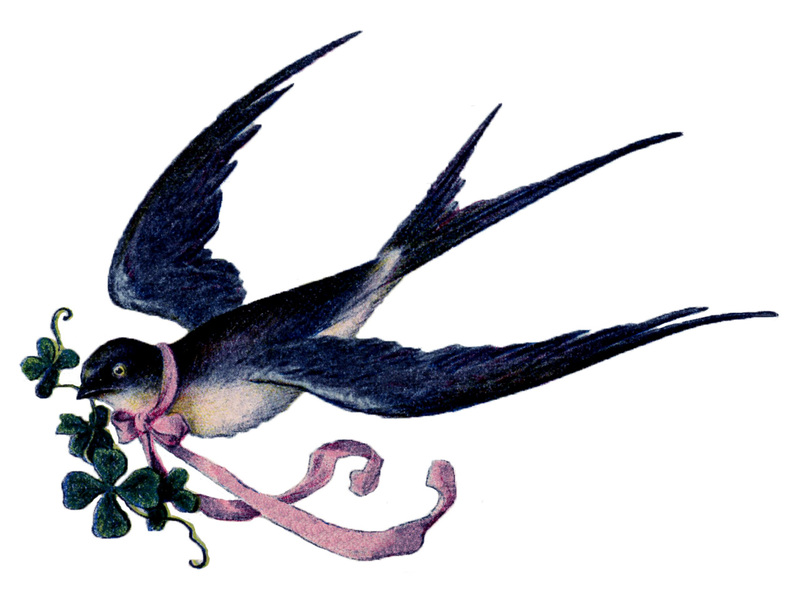 This is a Fabulous Vintage Swallows Image! Shown above are a lovely flock of Swallows flying across a blue sky with fluffy white clouds! Shown above is an old Advertising Trade Card, although there is no branding on this one. 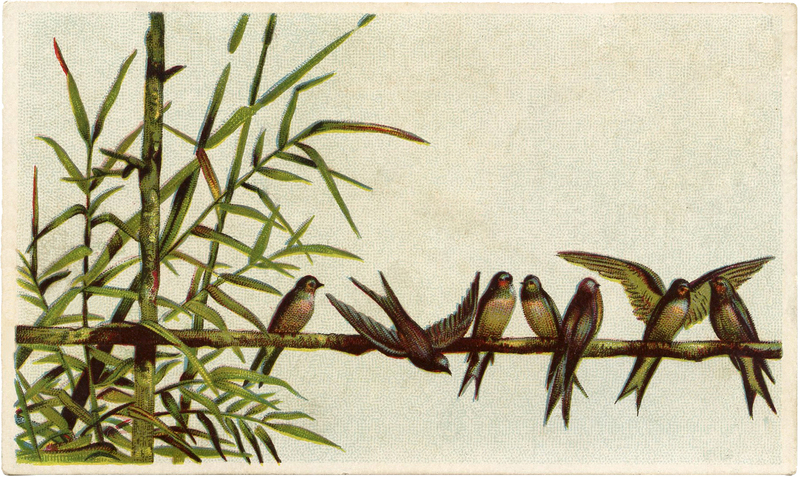 The card shows seven sweet Swallow Birds perched on a branch of Bamboo. 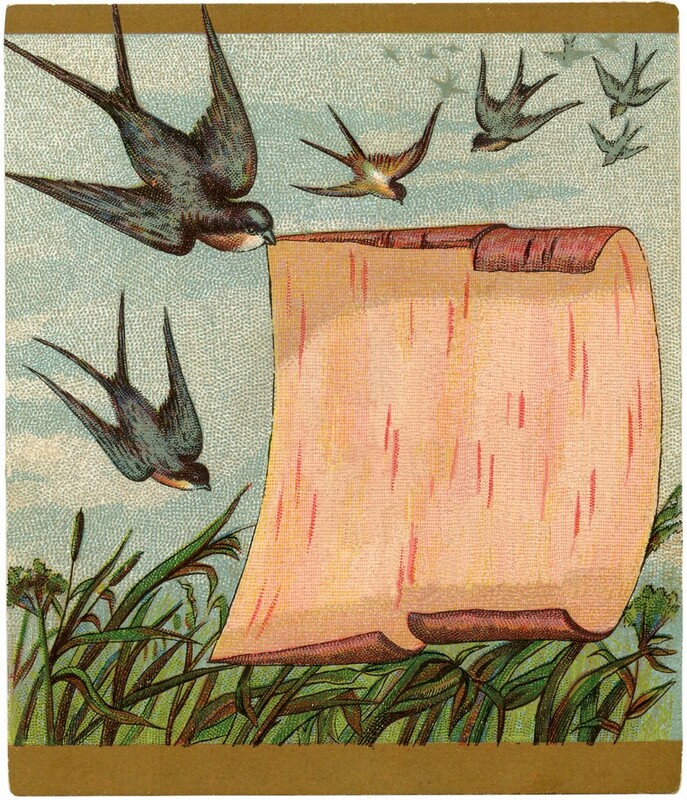 It is one of our Best Swallow Vintage Graphics! 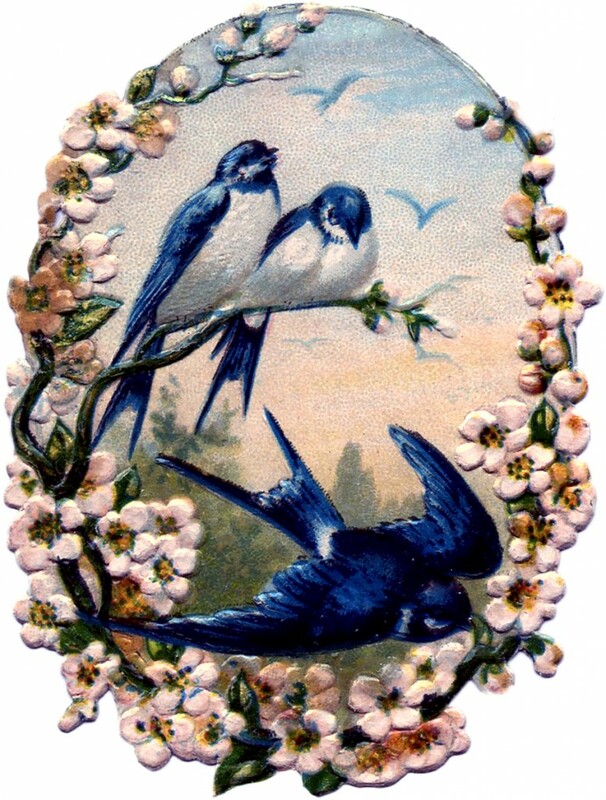 Featured here is a sweet Antique Card showing two lovely Swallow Birds flying together in the air. The art on this one is amazing. So pretty! 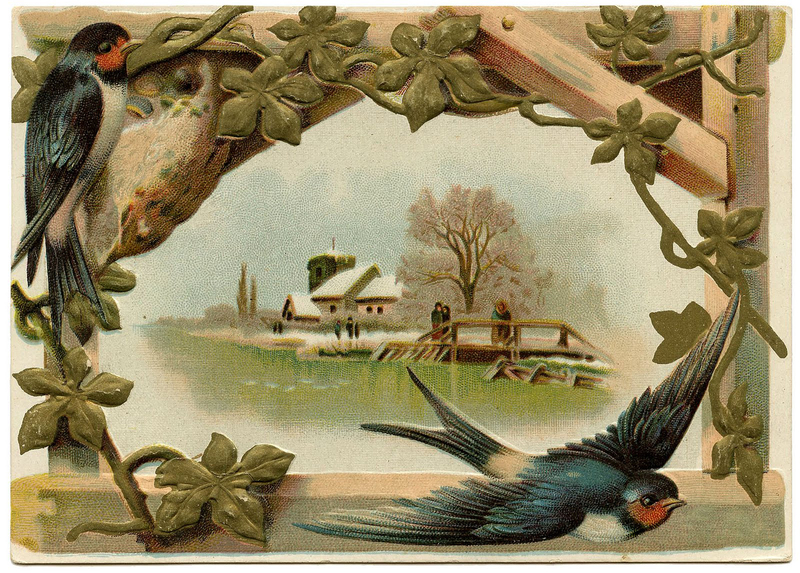 This is a strikingly colorful and detailed antique postcard, showing a Winter scene that’s framed with 2 lovely Swallows and green vines! 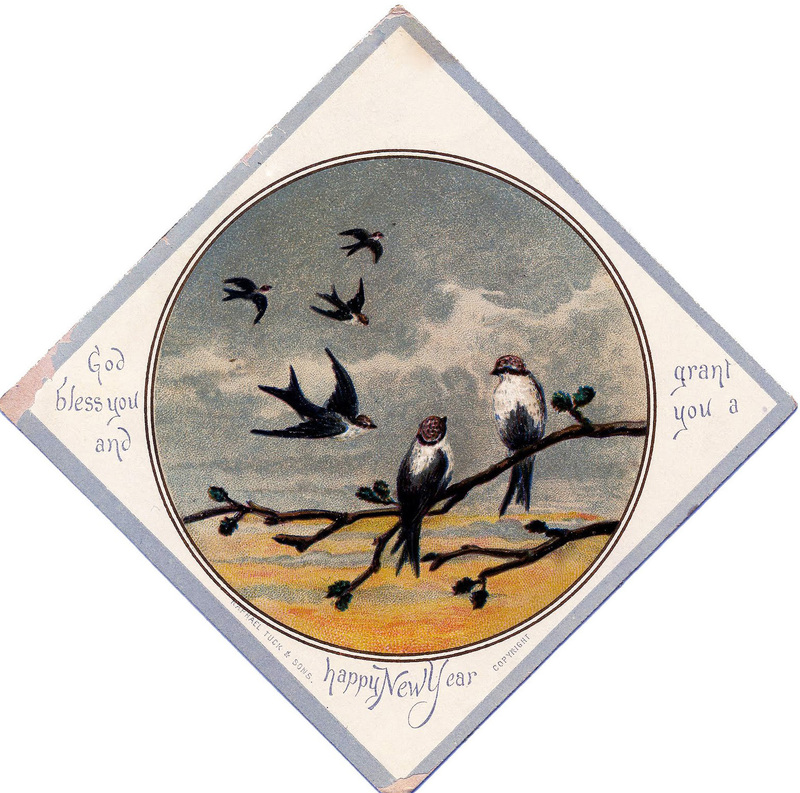 Shown above is a beautiful Victorian Trade Card with some charming Swallows. The Birds are flying and one is holding a sign that appears to be made out of Birch Bark. So charming! The sign shows an advertisement with the date 1887 on it. The original is at the bottom, but there is a second version without the text at the top, which enables you to customize it with your own text. 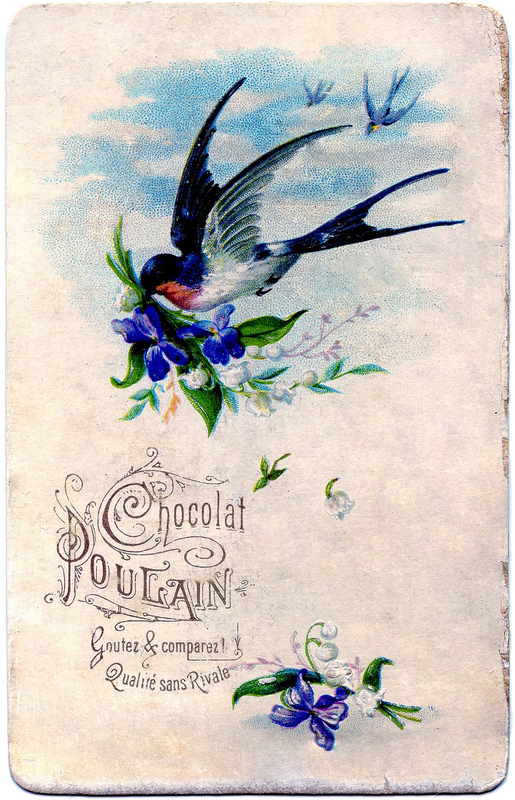 This pretty French Chocolat Advertising card shows a charming Swallow flying with a Bouquet of Violets! Swoon! I’m so in love with this one!! 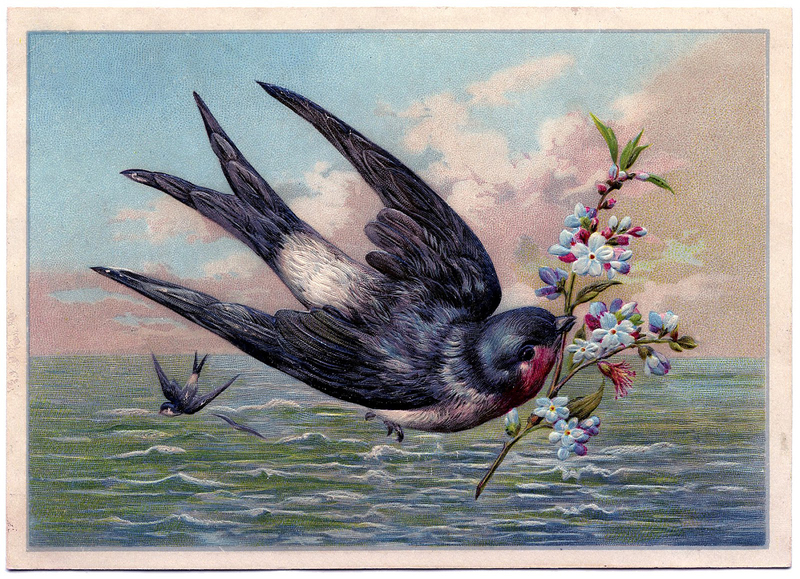 This gorgeous card is from France and features an amazing Swallow! 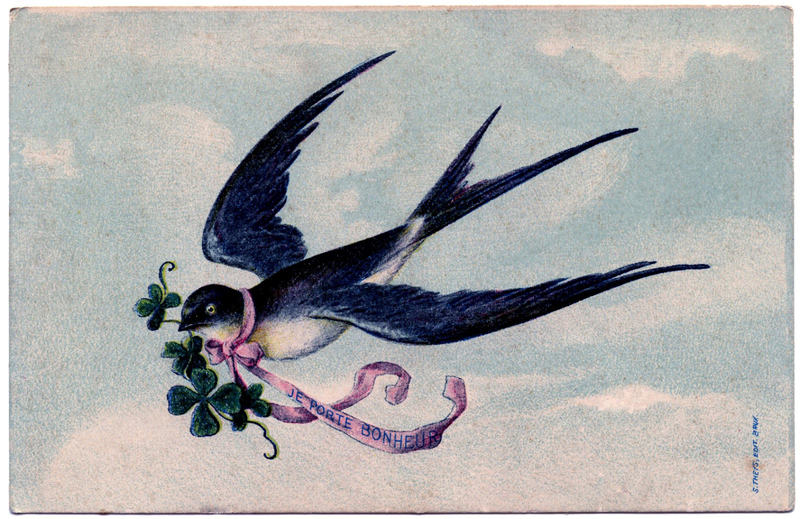 This dear bird is carrying some Clovers in its mouth and is wearing a pretty Pink Ribbon Garland around its neck. The garland says “I bring Good Luck” in French. I had to play around with this one because it’s just so pretty, so I’ve included 2 additional images without the background. On one of them I’ve removed the wording in case you want to add your own. I hope you like it! This is a very nice Vintage Victorian Scrap piece. 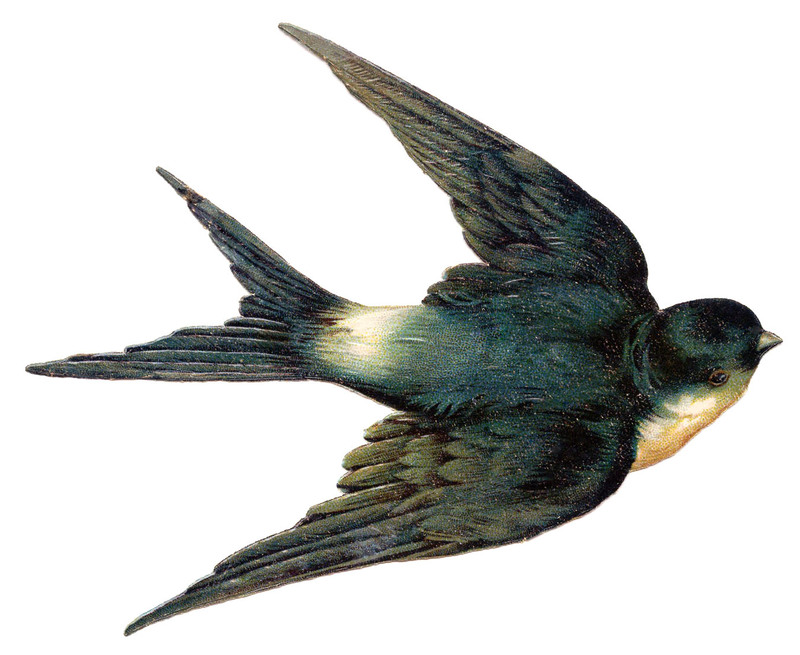 This one is also a Flying Swallow. The colors of this bird are just amazing. Featured here is an old Die Cut Scrap piece of a lovely Flying Swallow! Isn’t he a beauty?!! 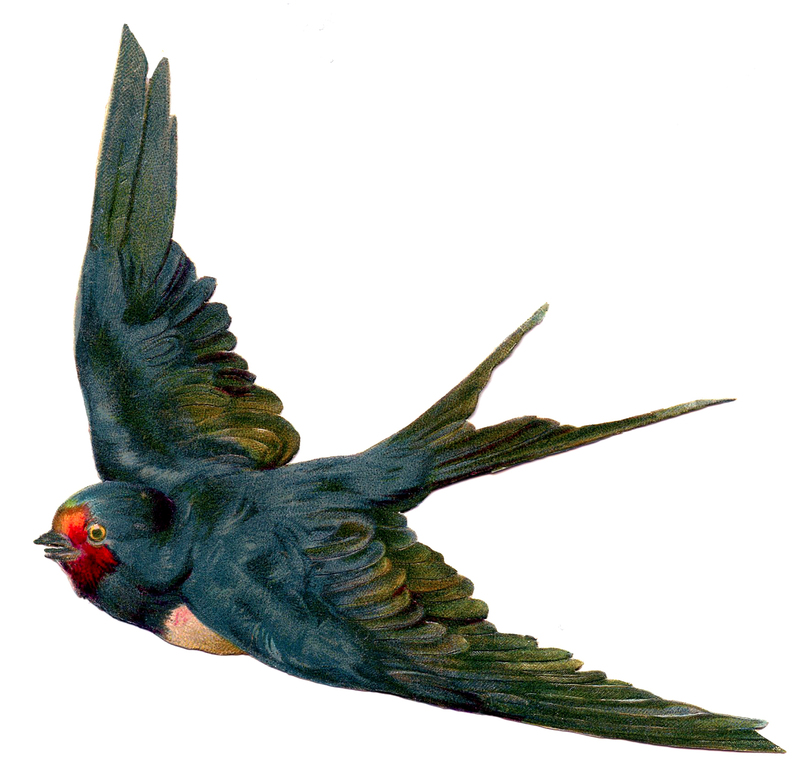 This Bird is scanned from a French Natural History Swallow image. 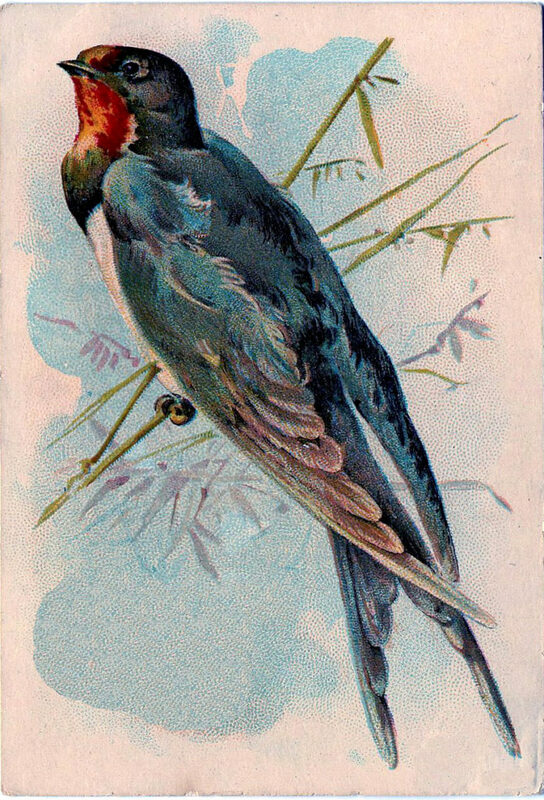 What an attractive Vintage Swallow Image! Here is another gorgeous Victorian Die Cut Swallow!! I think this may be the best one yet since it has such amazing detail, and I love that he’s flying with his wings stretched out. Such a beautiful Bird!! A lovely Vintage Birds with Flowers Scrap! Shown here are three lovely Birds, Swallows I think, surrounded by a frame of beautiful Flower Blossoms! I like the oval shape of this one and the nice bright colors. Here is a pretty Victorian Scrap pieces. 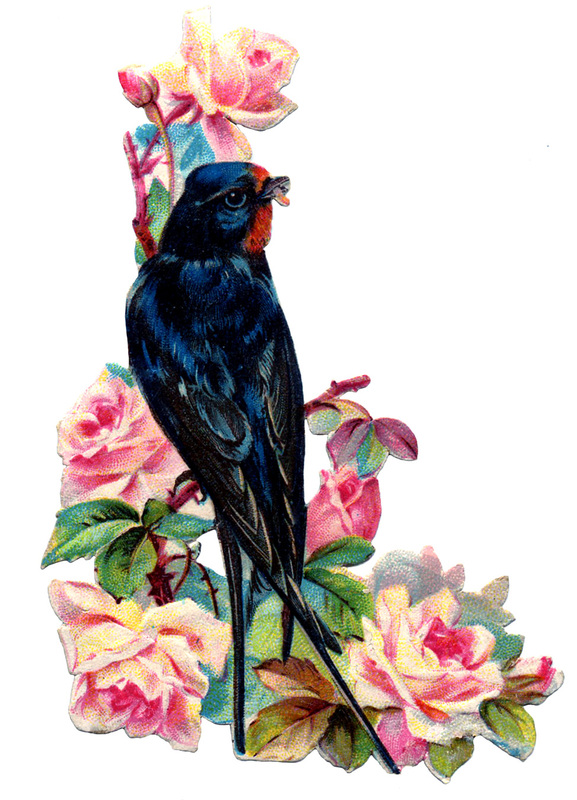 This one shows a lovely Swallow with beautiful Pink Roses! Here’s a classic looking Victorian Calling Card Image! 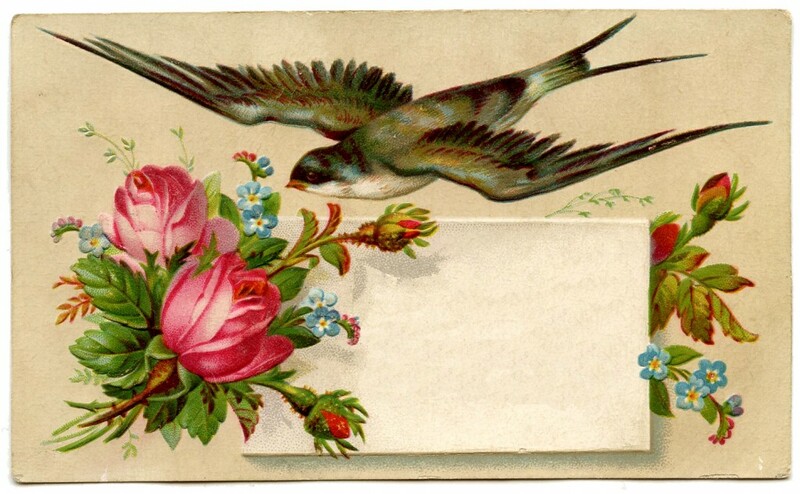 I thought this one was especially pretty with the Flying Swallow Bird and Pink Roses! There is a nice little blank space where you can write something. 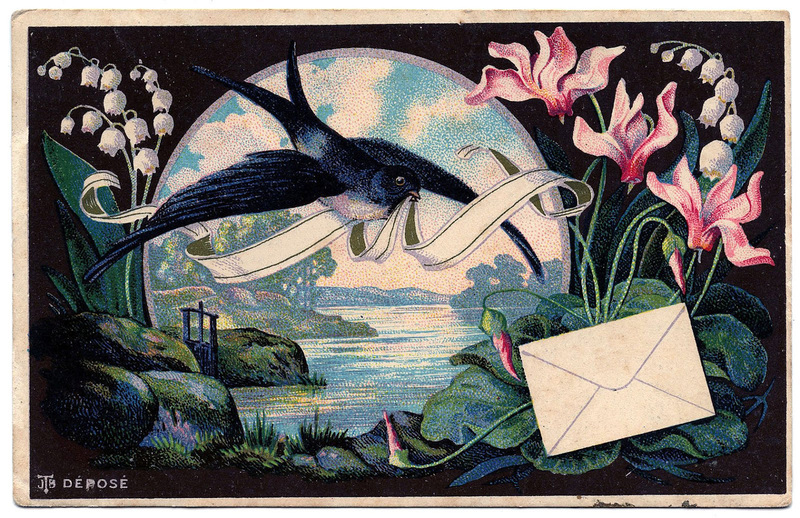 I love this pretty vintage blue postcard! This one has lots of charming swallows flying through the clouds. This is actually a Christmas card but, since it’s not really even close to Christmas right now I added a second version with the wording removed so that you can use it for whatever you like! 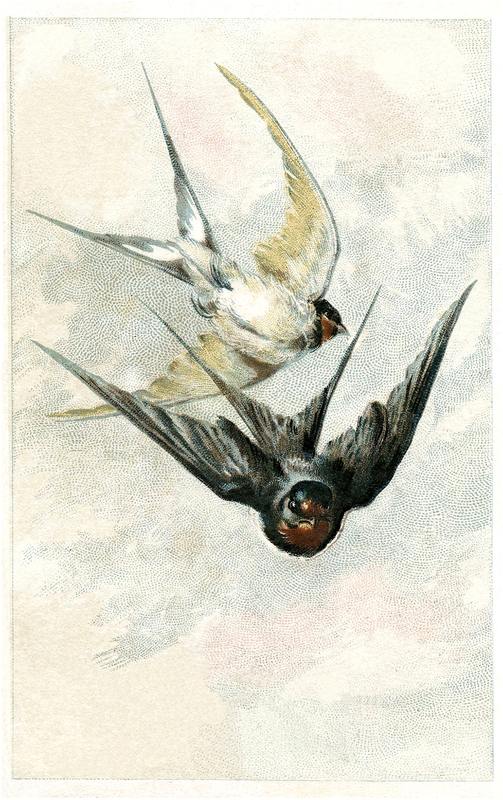 Above is a beautiful card showing a Swallow flying through the Sky. He’s carrying an envelope. Such a sweet image! 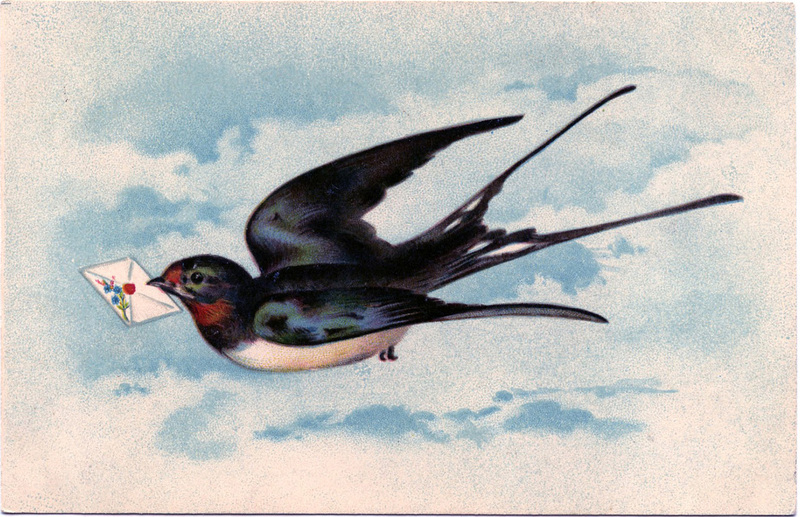 A very lovely French Postcard showing a Swallow flying with a Banner in its mouth. There’s a pretty scene of a pond or lake in the background along with some Lily of the Valley and pink flowers. I’ve included two versions of the original, one with the wording on it and a version with the text removed. 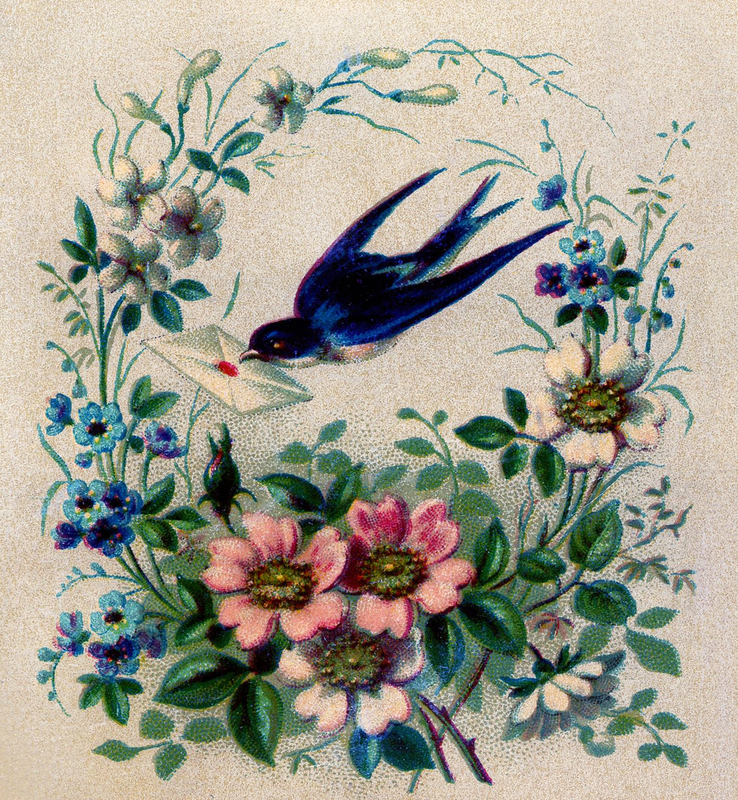 Here is a Fantastic Swallow Bird Label! 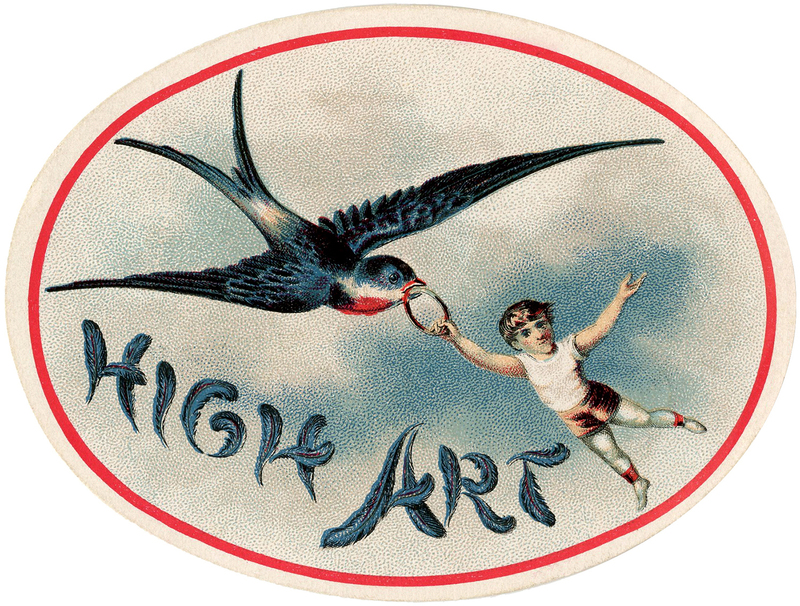 This gorgeous Antique Advertising Label shows a beautiful Blue Swallow flying through the air with a metal ring in his mouth. And holding onto that ring is a darling little boy! He looks a little nervous doesn’t he? I think I would be too! Such a quirky and fun old Ephemera piece! Here’s something for the quilters out there!! This is a wonderful antique advertising card for a Sewing thread company. This one has a beautiful Swallow Bird on the front of it. This would look great transferred onto a quilt square. This is a precious little vintage greeting card. The card is actually for New Year’s Day, but I thought the birds could be used for any occasion. I think the birds are Swallows. The diamond shape of the card is fun too! I hope you enjoyed this fun curated collection of 29 Best Swallow Vintage Images!!! You might also like our 40 Best Free Bird Images HERE. Splendid Antique Split Tail Bird Image! Birds & Nest Ephemera Images Kit! Graphics Fairy Premium Membership 9 Hummingbird Graphics Images – Updated! « 9 Sink Clipart Vintage Graphics -Pedestals etc – Updated! Oh my he is a beauty!! Thanks for sharing!! Goodness! This is stunning, thank you so much for sharing these fantastic images! I don’t know what I’d do without your site and it’s gorgeous eye-candy….:). He’s a beauty, thank you! I very much agree about what a beauty this bird is, and thank you for allowing others to have a copy. Thank you, which I should say more often to you, and others like you. Absolutely lovely! Thanks so much! OM Gosh i love it thank you Karen can’t wait to use it. I’m so glad you all liked him so much! I’m working on some variations of him right now, that I’ll post soon! Playing hooky — good! Great find! Wow, that’s fantastic!! Thanks for sharing! This is beautiful. It is the best Swallow ever. I’m going to use it soon. Thank you!! Such beautiful birds! Thank you so much for sharing! Wow, these are wonderful Karen. Thanks so much for offering them. Most of them seem “new” to me. Very exciting. Thank you Abby, so glad you are enjoying them! These are fantastic! The detail on these are fabulous! The colours are brilliant. I really enjoyed these graphics………thank you so much and have a wonderful day! Thanks so much Irene, you too!